Winner of 3 Golden Globe Awards, including Best Picture - Musical or Comedy, Best Supporting Actor - Mahershala Ali, and Best Screenplay. 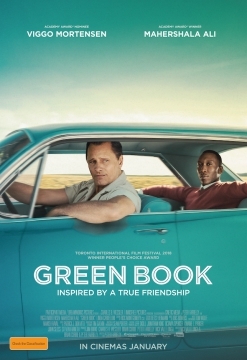 Viggo Mortensen and Mahershala Ali star in Green Book, a film inspired by the true story of working-class Italian-American Tony Lip and world-class black pianist Dr. Don Shirley, who hires Tony to be his driver on a concert tour of the Deep South in 1962. Despite their differences, the pair forge an unexpected friendship in a journey packed with humour and heart.